When the Hennessey Venom GT came out back in 2010 it took the world by storm with its 1,244hp twin turbo V8 shoehorned into the back of the small and agile Lotus Exige. Here we are six years later and even though the Venom GT set all kinds of records in both the coupe and convertible models, it was recently announced that Hennessey would end production on America’s 270mph supercar. To commemorate this monumental achievement, the guys at Hennessey built a special example they’re calling the Venom GT Final Edition. It’s been finished with this absolutely gorgeous “Glacier Blue” paint job that has the perfect contrast of the white racing stripes down the middle. However, the big improvement comes from an additional 207hp available under your right foot. 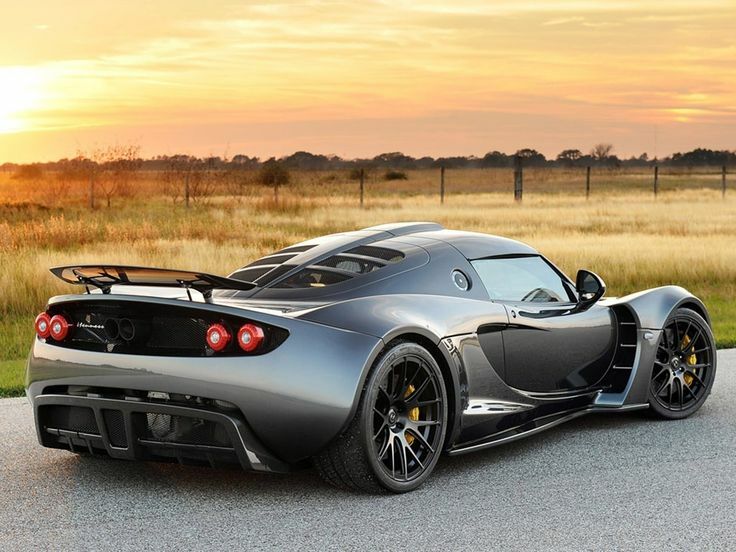 For the first five years of production, the Venom GT had twin turbo 7.0L V8 engine that was estimated to produce 1,244hp. Which it should be mentioned that it was the first supercar to attain and exceed the elusive power to weight ratio of one to one, something that most people think was accomplished by the Koenigsegg One:1. The 1,244hp example was the one used to set the record for overall top speed of 270mph, and the top speed of a convertible with 265.6mph. Another record that’s sometimes overlooked is the actually Guinness World Record for the fastest 2-seat sports car from 0-300kmh (186mph) in just 13.6 seconds. Point being, this car is stupid fast. The only other vehicle that produced that much power at the time was the Bugatti Veyron, and the Venom GT made it look like a giant VW Beetle. 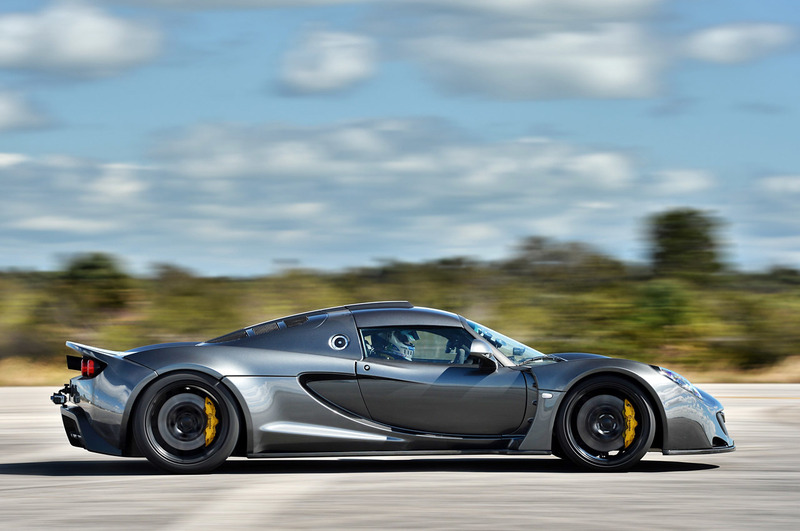 However, as more and more of these ridiculously high-tech, high-horsepower supercars like the Bugatti Chiron and Koenigsegg Regera came on the scene, John Hennessey realized improvements on the Venom GT were needed. So in 2015, he announced that thanks to a few small changes that allowed the use of E85 flex fuel, they increased the turbo boost from 19psi to 26psi which meant power was increased to 1,451hp! The changes were so minor that no additional weight was added to the car. That means that at 1,244kg (2,743lb), the overall power to weight ratio is now 1.17hp for every kilogram of weight. The estimated performance specs of the upgraded Venom GT are so quick that it’s almost difficult to wrap your head around. It will supposedly go from 0-60 in just 2.4 seconds, and from 0-100mph in just 4.4 seconds. That’s faster than some supercar 0-60 times. If you took it out to the drag strip, Hennessey claims it will run 9.4 seconds in the quarter mile. However, the most impressive stat is the 0-200mph time of 12.8 seconds. Back in 2013, the 1,244hp version set an unofficial record of 14.51 seconds, which crushed the previous record of 17.68 seconds set by the Koenigsegg Agera R set back in 2011. Even the Koenigsegg One:1 only managed to set a time of just 14.33 seconds, and it was believed to be the fastest accelerating production car on earth. 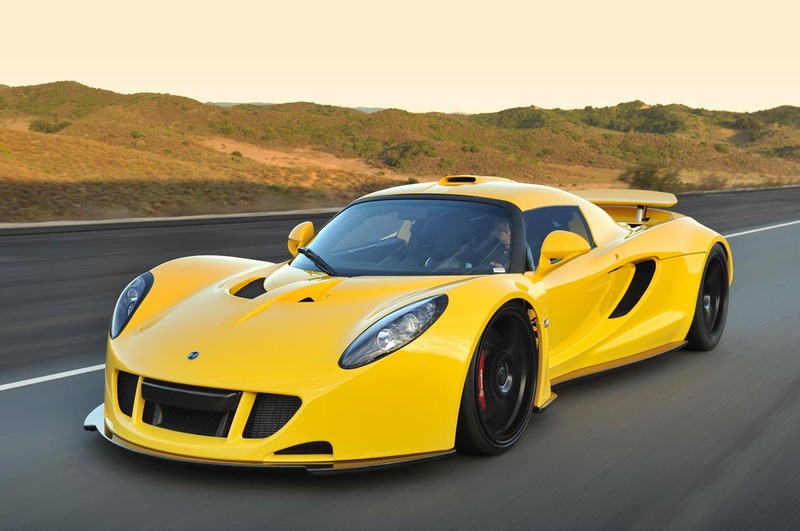 Hennessey’s also claiming that the upgraded Venom GT could easily reach up into the 280+mph territory. 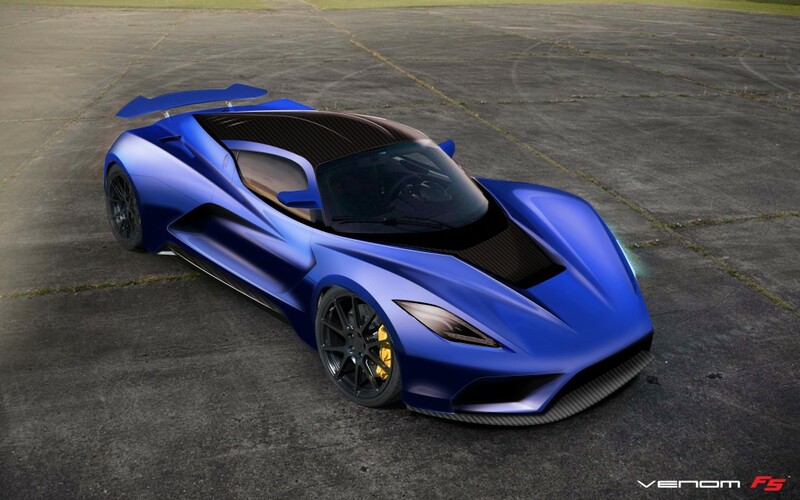 Unfortunately, only a small handful of the 1,451hp Venom’s were built and since production has now stopped, your chances of getting one aren’t very good. Actually, since production began in 2010, only 12 examples of the Venom GT have been made all together which make it extremely rare and potentially worth a lot of money someday. They only made one example of the Final Editon GT, and they sold it for just over $1.2 million to some very fortunate buyer. If you missed your opportunity to own one of these fantastic machines, don’t fret. Even though production is ending on the Venom GT, John Hennessey has many other tricks up his sleeve. 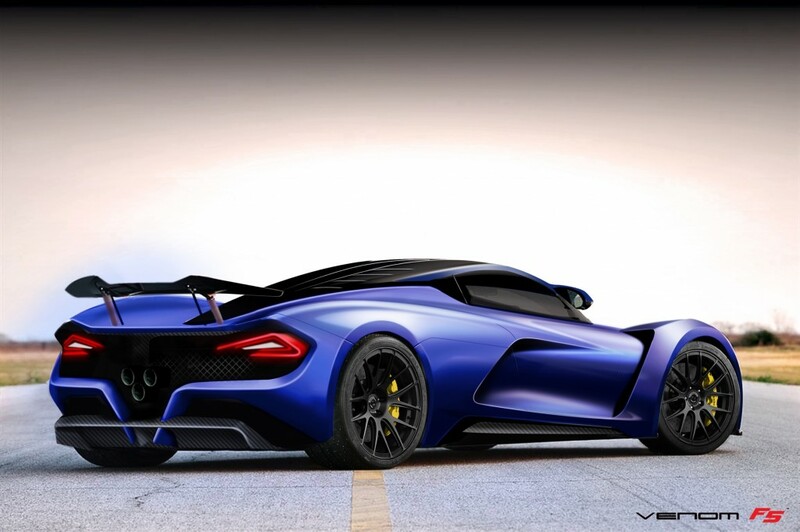 He apparently has gone on record and said that they will be debuting the Venom F5 sometime in 2017. It’s supposed to have over 1400hp and have a top speed of 290+mph, but those are the projected specs that have been talked about for almost a decade now. It’ll be interesting to finally see this F5 become a reality, but only time will tell. We are a bunch of overly obsessed enthusiasts who love and live the motorsport culture and have an unwavering passion for anything that has a motor and moves. We seek to entertain and inform with a unique style that celebrates the lifestyle, the people, the machines, the power, the speed, the sounds, and the antics. Happy moto'ing!